I'm not a big movie person. I don't even have a functioning television, and my trips to movie theaters are few and far between. But I went to see Avatar. Not only saw it, but went back to the theater and saw it AGAIN – something I've never done before in my life. You've heard about Avatar – super big-budget film by James Cameron of Titanic fame (this is how much of a not-a-movie person I am: I've never seen Titanic) about blue cat people. You may have heard that the visuals are a technological breakthrough, or that it is a heavy-handed commentary on race -- but what you probably haven't heard is that this is a perfect movie for gardeners. Don't believe me? Well, let's just say that the first time you meet one of the main characters, you are told that “she likes plants more than people.” Sound familiar? And once the movie arrives on the planet Pandora, you are immersed in an incredibly lovely, lush, digitally generated jungle packed with plants you will wish you could grow. Sadly, the chances of finding anything biolumenescent in your local garden center are pretty slim, but still: some of the scenes are startlingly beautiful, and have got my brain churning with garden design ideas. Sure, the movie is a sci-fi action thriller with lots of big explosions and exciting fight scenes – but even those are built around things a gardener can understand: They are battles to save beautiful trees. Lovely trees around which the religions and emotional lives of the alien Na'vi are built. So go see Avatar. Ignore the sci-fi action, explosions, and racial subtexts: Go see it for the plants! Memo to Baker Creek Heirloom Seeds: Sell seeds not politics. I just put in my first ever order from Baker Creek Heirloom seeds. I'd heard good things about them from other bloggers, but when their catalog arrived, I was a little put off by the random quotes scattered throughout the pages. Most of the quotes are simply inspiring or religious, but a few are wildly, irrationally, anti-science and made me quite upset (I'm all in favor of debates about genetic engineering – but sweeping statements about the “tyranny of science” are nonsensical and show a profound ignorance of what the word “science” actually means). Despite the annoying catalog, they had stuff I wanted, so I bit my tongue and placed my order. The seeds I ordered arrived promptly – in envelopes which, most of them, had pictures not of the plant in question, but rather generic images of tomatoes or corn and MORE quotes denouncing things like using biotechnology to help feed the world's poor, and government investment in plant breeding -- both things which I feel rather strongly about. Government investment in plant breeding happens to pay my salary at the moment, and is one of the few things I'd like to see out government doing more of. More importantly, the self-satisfied efforts of well-fed, rich, first-world environmentalists keeping incredible technological breakthroughs like genetically engineered vitamin fortified rice out of the hands of the world's starving, malnourished people makes me frankly enraged. I'm sorry but, I wanted seeds, not extreme, holier-than-thou statements about the moral superiority of their products. Baker Creek will not be on my list of seed companies to order from next year. Studio G's blog had a piece on an amazing looking topiary garden in South Carolina. Well worth checking out. Garden Rant's Susan Harris makes the point that snow is a design opportunity in the garden. If you aren't a sort of academic plant geek, you might not appreciate this but: Allan Armitage is going to be dancing the hustle at a fund raiser! I want to see a dance-off between him and Michael Dirr! Linda Chalker-Scott on The Garden Professors does a spot-on debunking of the "chemicals are evil" mindset. In November, I started participating in Garden Bloggers Bloom Day, the monthly event hosted by May Dream's Gardens where garden bloggers post pictures of what is blooming (or just looking pretty) in their garden. At the time, I didn't think much of it other than "Oh, this will be fun!" but it is already making me think differently about my garden. I've never focused much on having stuff in my garden in the winter -- basically November through February I just hunker down with books and catalogs and wait it out. Now, seeing all the other posts from other gardeners with bright berries, stems, and leaves in their gardens is making me think differently. 2010 is going to be the year I get serious about making my garden lovely in the months I usually ignore. So I took a walk through the MSU horticulture gardens, and noted down what was looking good now, in the middle of December, after we've had temperatures into the teens and below. Red twig dogwoods are looking great -- such an intense color for this time of year. Sedum 'Angelina' -- I walked past this planting every day all summer and was completely unimpressed, but in the cold the colors have intensified, and today it shone out at me from the other side of the gardens -- this picture doesn't capture how bright it looks compared to the dim, gray Michigan winter around it. I am definitely including a lot of this in my garden for next winter. I've always liked deciduous hollies, but this planting takes them to another level -- the Miscanthus makes a perfect background to ensure every berry glows. A great combination I'm also going to steal for my garden. Ornamental Kale. I'm not totally sold on these... This much color this time of year is hard to turn down, but I don't like their growth habit so much. A grouping of plants doesn't seem to blend together into one mass. Does anyone know a variety which has a looser, more open habit? That's what I'd really like -- those same intense colors, but not in such a rigidly define blob. Yucca filamentosa 'Color Guard' Another plant I'm not a huge fan of in the summer, but in the dim grey winter days, that yellow is AMAZING, a burst of sunshine. So that's what I've been looking at. What other plants for winter color should I be considering? I know I want more conifers, and I'm also considering some heaths and heathers, some of which are supposed to have great winter foliage color (but will they be hardy?) But what do you recommend? What really shines in your winter garden? Before you answer that: if you live somewhere warm, and think of marigolds as winter color I don't want to hear about it! It will just make me jealous and malcontent and I'll have to creep off to a greenhouse to recover. I've been wildly, crazily excited about this since I was browsing through the Secret Seed catalog on-line, and stumbled across their listing for Impatiens namchabarwensis. Okay, drooling yet? 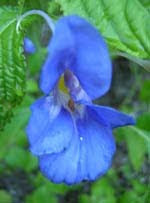 A blue impatiens -- And such a lovely shade of blue too! According to Strange Wonderful Things, (which is SUCH a great name for a website) it is a new species only discovered in 2003 in Tibet in a remote canyon twice as deep as the grand canyon! Even more excitingly, everything I've been able to find describes it is very easy to grow, carefree, and even "gently" self seeding! At this point I was almost jumping up and down. Well: Let's be honest, I was jumping up and down, nothing "almost" about it. My partner is used to this by now and simply asked me what plant I was excited about, to which I replied "A BLUE impatiens! BLUE, I tell you, BLUE!!!" Finally, I sat back down to put in my order for the seeds, only to see the words "OUT OF STOCK" in big red letters. Out of stock? Are you kidding me? I rushed to google. Out of stock. Out of stock. Everyone seemed to be out of stock. Finally I went to e-bay and found someone selling 7 seeds. Just 7 of them! On auction, and the bidding wasn't to close for 6 DAYS! I quickly put my bid in, and PRAYED no one else would notice it. Thank goodness, no one did, and the seeds are now on their way to me! Glorious blue impatiens, you shall be MINE! The good news is that this looks like a super awesome plant you are all going to want. The bad news is that I just bought the only supply of seeds I could find anywhere. So I guess you are all out of luck... (I should feel bad about this, but mostly I'm just feeling smug that I snatched up these seeds in time) But as soon as I get the plants growing, I'll be harvesting all the seeds I can so I can spread the joy around to anyone else who wants to try this amazing looking plant. Addendum: I just re-read this post before publishing it, and it comes off as a little... extreme. But what can I say. I ALWAYS go completely, utterly, head-over-heels gaga for true blue flowers. If you don't suffer from a similar true blue obsession (Carol, is there a name for this particular gardening disorder? ), you might think I'm a little crazy. Whatever. I don't care. It is BLUE. Starting off this week with celebrity gossip: Gardening is Nicole Kidman's stress-buster, according to the Times of India. From MATT Kinase, aka The Scientist Gardener: A virus that melts caterpillars. Yes MELTS. It is really cool, but in a really gross way. Here is the US news papers are busy publishing their best songs or movies or books of the decade ending, but in the UK (where they understand gardening) the Telegraph has a piece on the decade in gardening with a major emphases on the naturalistic design ideas of the amazing Piet Oudolf (see my pictures of the Oudolf designed Lurie garden in Chicago here). Reading stuff like this makes me so jealous of the Brits. This article honest to goodness discusses the "signature color combination of the late Nineties" as being Dahlia Bishop of Llandaff and Verbena bonariensis. Can you name the signature color combination of ANY decade in the US? Besides green lawn and too much dyed wood chip mulch? Great book review from Zanthan Gardens -- I confess to being a total essay addict, so to learn about a new (to me) book of gardening essays is always a treat. Extreme guerilla gardening -- planting 200 trees to protest a proposed shopping center! And the town isn't even going to remove them! Gotta love the Brits. Looks like one thing to come out of Copehagen is a system to pay countries to preserve forest lands. The article includes the surprising (to me) statistic that rainforest destruction accounts for 20% of global CO2 emissions. Really? That's crazy. If you don't read The Garden Proessors blog (which you TOTALLY should, because it rocks) you need to go over and check out this post by Bert Cregg on native vs nonnative plant issues. Really interesting, thought provoking post which goes way beyond the native vs nonnative dichotomy to really think about choosing plants that maximize diversity and ecological health of urban plantings. I pulled out my sketch pad and started drawing, while looking out the window at all the snow. What sort of garden drawing does snow inspire? Well, as I drew and thought, I realized: Mostly, I'm dreaming about spring. I'm dreaming about May... 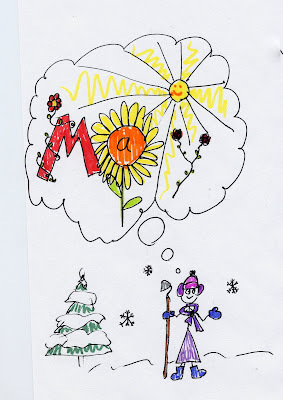 So I drew a picture of Hortense Hoelove, (aka Carol) in the snow, with her hoe, dreaming of May. A couple news stories this week that got me thinking. In the NPR piece, Scott Simon moderated a sort of debate between Freakonomics (and Super Freakonomics) author Steven Levitt and Peter Frumhoff of The Union of Concerned Scientists. Levitt advocates geoengineering to fight global warming in the short term while we get CO2 under control -- things like pumping sulfur dioxide into the stratosphere to reflect sunlight and cool the earth. I'm personally skeptical, though a little intrigued, but Frumhoff's arguments against it were... well, fairly shocking. He started arguing that it wouldn't work, but when Levitt pushed back, he basically confessed he thought it was dangerous mostly because it would make it harder to get people behind reducing carbon emissions. In other words: talking about this will make it harder to get people to do what I want them to, so it is better to just pretend it isn't an option at all, especially as world leaders are meeting to try and agree to significant emission reductions. In response, Levitt asked: "And if the U.S. were to meet the standards that Barack Obama has proposed, what will happen to the temperature of the Earth over the next 50 years?" There was a long, uncomfortable pause, and then finally Frumhoff admitted: "Well, we're going to see some warming." In other words: Carbon reduction, on any scale being talked about, will not solve the problem in the short term, while geoengineering possibly could. But we mustn't talk about it. Now, geoengineering certainly could have lots of other negative effects as well, it seems far from a perfect fix or even a practical one -- but shouldn't we at least be having a discussions about it? We hear so much about how horrible severe global warming could be, so shouldn't we at least consider all the options, no matter how wacky they may seem? Yet the attitude taken by Frumhoff is frankly antidemocratic: don't tell people all the options in case they decide on a different option than the one we, the experts, think is best. Don't discuss the pros and cons of emission reduction vs. geoengineering, just accept as decreed that carbon emission reductions are the one true way. Even more disturbingly anti-Democratic is this story in Science about leaked private e-mails between top climate scientists. A lot of disturbing content, most strikingly this particular quote from CRU (Climate Research Unit) Director Phil Jones referring to requests from global warming critics for a file of raw global temperature data. He wrote: "I think I'll delete the file rather than send to anyone." Other e-mail exchanges regarded trying to keep controversial research findings out of the 2007 IPCC report, saying "Kevin and I will keep them out somehow - even if we have to redefine what the peer-review literature is." Basically, the e-mails contain various versions of the same story: Rather than releasing data that they feared could be misinterpreted, they made an effort to control the message so only information that supported their conclusions were made public. The factual omissions revealed by these e-mail exchanges are apparently not that damaging to the actual science -- the scientists seem to have good reasoning behind drawing the conclusions they have from their data, but the choice to simply promulgate their conclusions rather than the full course of reasoning that lead to those conclusions is very disturbing -- beyond disturbing. If I, in my research in grad school, tried to hide data which didn't support my conclusions I would be kicked out of school, and rightly so: Transparency is at the very heart of science. You always present the data that supports your conclusions, AND the reasons you might possibly be wrong. I consider myself an environmentalist, and have never considered myself a doubter of global warming, but this story has frankly shaken me. What these scientists have done is put political dogma ahead of honesty and truth. How then are we to trust them? They think, I guess, that because global warming is so serious, it is too important to debate. I feel quite the opposite: For something that important we need all the facts and all the debate we can get. Council orders grandmother dig beloved garden store unsightly wheelie bins I love that in the UK, someone having to rip out their garden is correctly viewed as a news-worthy tragedy. Keep off don't touch Michele from the always great Gardenrant gives a spot-on analysis of bad landscaping -- my favorite quote: "...yards are not petting zoos for spruces, nor passive sponges for weed-and-feed, but places that actual humans should enjoy." Confessions of a Sweatshop Inspector Totally off topic for this blog, but human rights and fair labor practices should matter to everyone. This is a fascinating piece on sweatshops, and has some really good information on how to figure out if a company is exploiting its workers. Breeding blight resistant chestnuts A nice little story from the Baltimore Sun about efforts to restore the now virtually extinct American Chestnut via breeding with the blight resistant Chinese Chestnut. My grandfather has always been extremely interesting in this project, so I like keeping up on it. Chocolate Flower Farm I don't remember how I stumbled on this nursery, but: they specialize in flowers which are chocolate colored. Kinda strange. First time I've heard of a nursery specializing by color. But if you are into black/brown foliage and flowers (Ahem: Fern) you might want to check them out.